Do you want to transform your home with new carpeting? A soft and attractive material, carpets are always a good choice for any home. Whether you hope to enhance the ambience of your living room or rejuvenate the appearance of the entire home, you are sure to find something that suits your needs from our extensive carpet options. If you want home carpet that is aesthetically pleasing and functional, we have what you need at prices you can afford. Whether you want Frieze, Saxony, or Berber carpet, you will find exactly what you are looking for at our store. In order to be sure that you pick the right type of carpeting, let us know what you expect for your new carpet. 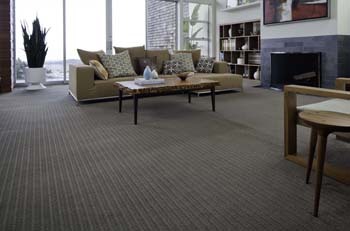 Do want soft and durable carpets in the family room that can withstand high volumes of traffic? Are you searching for luxurious plush carpeting to make your den the pinnacle in comfort? Our flooring store has a variety of styles, textures, and colors that are sure to fit your needs in looks, performance, and price. We can help you decide on the ideal carpet for your interior design plans. You will find the feeling of carpet improves the overall atmosphere of your home, giving children a soft place to play and offering an overall welcoming environment. Carpet is also an effective sound barrier that will help cover up noise that travels throughout the home. Many customers select Berber carpet for its combination of beauty and durability. It features a loop-pile construction the gives it the distinct knot appearance, mimicking the look of hand-woven carpets. Berber carpet fibers are very resistant to spills, so you do not have to worry about a little accident turning into a permanent stain. The design options available with Berber are virtually endless. Our inventory features a multitude of styles and color patterns, so you can find the perfect match no matter what type of decor you want to enhance. Most Berber carpet has a flecked color scheme, which is a versatile style that fits in well with most interior design schemes. Not only is Berber aesthetically pleasing, it is also pleasing to the touch. The loop-pile construction gives it a soft, cushy feel that is great for sitting or standing on. Best of all, all of our Berber carpet options are extremely affordable. Considering all the benefits this type of carpeting offers, it is hard to find another flooring material that has the same outstanding value. To get the most out your new carpeting, allow us to handle the installation process. We have trained installers with the skills and equipment to put in new carpets quickly and correctly. The surface of your new carpet floors will be perfectly level, and the edges will fit the perimeter of the room seamlessly. We also make sure to securely attach the carpeting to the subfloor, maximizing its longevity. After we finish the carpet installation, we would be happy to lend advice about carpet upkeep. If you want your investment to endure for many years to come, you simply need to keep it clean. A good vacuuming on a regular basis will make sure your flooring stays in top grade condition. You can expect your new carpets to last a long time with proper maintenance. Contact us today to learn more about our discount carpet options. We proudly serve all communities in the Fox Valley & Green Bay area.